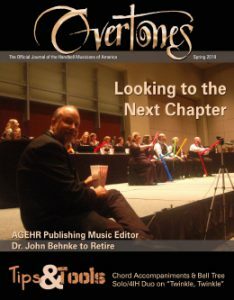 Handbell Musicians of America is pleased to announce the return of the Distinctly Bronze Associate Conductor. Through an extensive application and interview process, this program will select an Associate Conductor for Distinctly Bronze East 2018 and Distinctly Bronze West 2019. The selected Associate will work closely with either Lee Afdahl (East 2018) or Bill Payn (West 2019) in a mentoring relationship that provides training in massed conducting and the opportunity to conduct one selection on the Distinctly Bronze program. The application for this program is now available here. From the initial applicant list, four finalists will be selected for web/video conferencing interviews to make the final selection of two Associate Conductors, one for each event. Those selected will receive airfare to and from the event site and lodging at the event hotel during the days of the event, as well as all items included in the standard event registration (included meals, polo shirt, CD of final concert). The Associate Conductor will NOT ring during the event, instead focusing their time on observing and working with the event’s Music Director to improve and develop their massed conducting skills. Applicants must either have a minimum of a Bachelor Degree in Music (or the equivalent training with an emphasis in conducting*) or currently be enrolled and working toward their Bachelor of Music and have completed at least two years of in-classroom and/or ensemble conducting. 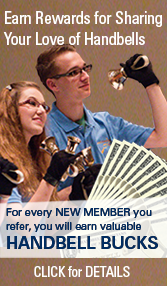 Those who have completed both Conducting 3 and Music Theory 2 in the Handbell Musician Certification program are also eligible. Applicants will be required to provide a minimum of three references from individuals including those who have observed the candidate conducting and observed their work with handbells. References must complete and submit this reference form before the application is considered complete. As our event Music Directors, Lee Afdahl and Bill Payn may not be one of the three references. Applicants will be required to provide a link to a video showing them conducting two full selections of music of contrasting styles. The video must show a full-body view of the conductor facing the camera while conducting a handbell choir. Conducting to a recording or a non-handbell group is not acceptable. Applicants whose submissions do not match these criteria may be disqualified or asked to re-submit. Some experience with ringing handbells is preferred as is familiarity with massed ringing events/settings. *The determination of what constitutes “equivalent training” will be at the sole discretion of the selection committee based on information provided during the application process. All decisions of the committee are final. Deadline for submitting an application and all accompanying references is April 1, 2018. The four finalists will be selected by May 1 2018. Web-conference interviews will be completed by May 25, 2018. The final selections will be announced by June 1, 2018. Distinctly Bronze East dates: October 4-7, 2018. The event will be held in New Bern, North Carolina. Distinctly Bronze West dates: February 28-March 3. The event will be held in Welches, Oregon.